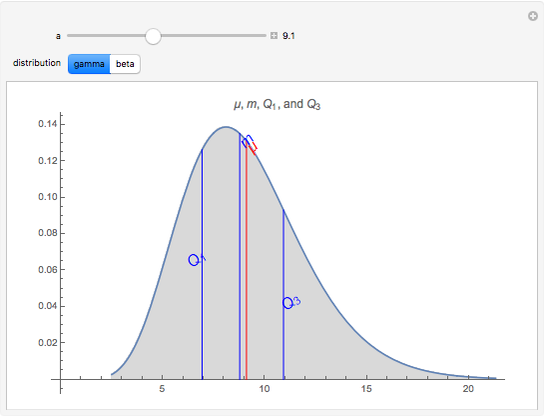 This Demonstration provides a visualization of the relationship between the mean, , and the median, , in positively (right) and negatively (left) skewed distributions, as well as the quartiles and . 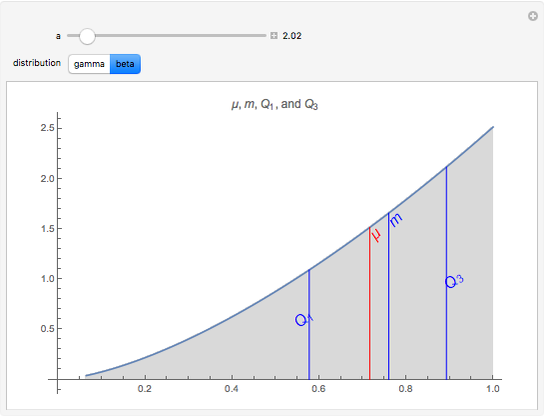 The positively skewed distributions used are the family of gamma distributions with unit variance and shape parameter . 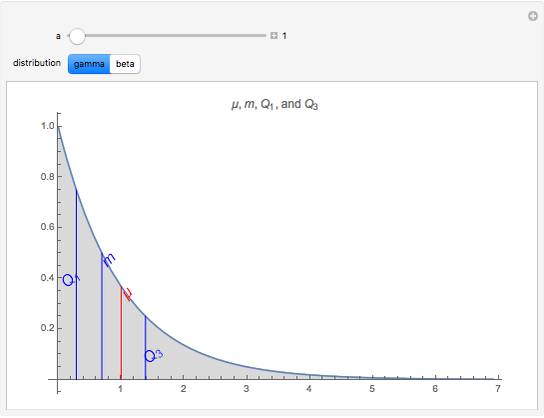 Beta distributions with parameters are used for the negatively skewed distributions. The mean is the average value and corresponds to the center of mass of the area under the curve, thinking of that area as a solid of uniform density; corresponds to the balance point. The median, , divides the area under the density in half. Since the mean is sensitive to outliers, it tends to be dragged toward the right in the case of positively skewed distributions and so . The inequality is reversed in negatively skewed distributions. The quartiles , and divide the area under the distributions into four equal parts with 25%, 50%, and 75% of the area to the left of , and , respectively. The Demonstration also illustrates the fact that for right-skewed distributions, and the inequality is reversed in the left-skewed case. This relationship is the basis for the built-in Mathematica function QuartileSkewness that provides a more robust estimate of skewness when outliers are present. Ian McLeod "Mean, Median, and Quartiles in Skewed Distributions"